As marketing leaders take on more and more responsibility for the whole customer experience and specifically the whole digital experience, they realize their current slow/siloed approaches are unfit for the pace of innovation and learning needed to “nail” the right customer experience. Marketing wants to be able to close a fast learning loop and run mini “innovation labs” as part of the wider marketing organization not just the “cool kids” in the corporate innovation lab. Many people try Agile Marketing in the small by mapping directly from the Agile Development. They send a few individuals to agile training (e.g. a Scrum Master class) or ask some coaches from the development side to help them out. Then a few weeks/months later they’re so confused and struggling that they either throw it away (Which is a shame but isn’t a trigger for a real agile transformation…) or they realize they need to look the things in a deeper more holistic and pragmatic manner. Similar to trying and failing, but these organizations tried some small agile experiments and understand they need to look at it differently now that they want to scale it further. That is especially popular with middle managers that are trying to make ends meet with more and more workload and the same (or in some cases even fewer) people. As Dev/IT/Technology organizations move to Agile/DevOps approaches, Many marketing leaders feel the need to align their language, process, cadence with the way their peers are working and talking. 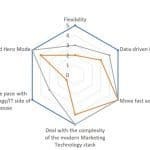 As marketing organizations try to build a modernized marketing technology stack many of them are realizing that they need an effective adaptive process to help deal with these complex projects. Since much of a marketing technology stack improvement project includes technology/development work it makes sense to everyone to use an agile approach to it. This then cuts across to some of the marketing-style work that is associated with the new technology stack, which in many cases brings about a wider discussion about an agile operating system for marketing. Trying a new approach to marketing involves a lot of uncertainty and complexity and collaboration across silos. Smart marketing leaders connect the dots and realize Agile Marketing is the right approach for figuring out how to effectively do Content Marketing, Social Selling, Account Based Everything, or whatever new thing you’re trying. Agile and Agile Marketing Coach | Partner and CTO at AgileSparks | SAFe SPCT | Kanban and Lean Startup approaches expert | Author of "Holy Land Kanban"
If they self-organize, what is our role as team leads? How can HR people make a difference in an Agile transformation?